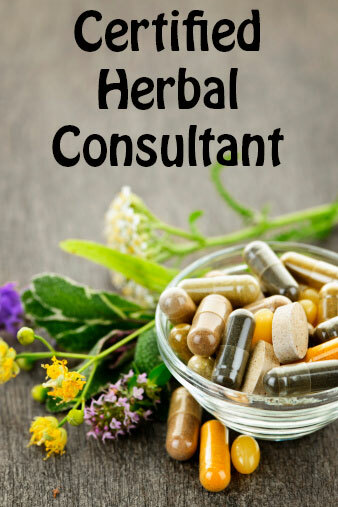 The Certified Herbal Consultant program is for people who would like to earn a part or full-time income helping others with herbs and natural remedies. All the courses in the Family Herbalist Certification are required to complete this program. It builds on that foundation and offers additional courses to increase a person's knowledge of herbs, their chemistry and actions and how to apply them. Most importantly, it teaches basic assessment skills that allow you to figure out which herbal remedies a person needs without diagnosing and prescribing diseases. In addition to the webinar classes, this program includes a two-day hands on workshop to allow you to practice skills like muscle response testing, doing tongue and pulse analysis and reading a person's glandular body type. This will help you gain confidence in using the assessment techniques. This program also provides you with business training that will teach you how to set up, promote and manage your consulting business. Plus, we provide graduates with their own special forum where they can get assistance both with client cases and with business building questions from Steven Horne and other CHC graduates. This is the overview course for everyone enrolled in the complete CHC program. This is where we provide access to Monthly Training and Q&A sessions with Steven Horne and other activities pertaining to the entire CHC program. Course Fee: $247 for early registration. $277 for late registration. $50 discount for herbiverse members. Price includes a kit containing a small sample of all the herbs we'll dicuss in detail in the class. Course Fee: $197 for early registration. $227 for late registration. $50 discount for herbiverse members. Required For: Certified Herbal Consultant program. Can be purchased separately or as part of the CHC program. Prior completion of the Practical Tools for Health Assessment correspondence course meets this requirement. Webinar (2016): Students do not have to participate in live webinars to complete the course. All classes are recorded and posted online. Course Fee: $297 for registration. $50 discount for herbiverse members. Required For: Certified Herbal Consultant. Prerequisites: Traditional Health Assessment and The ABC+D Approach. Course Hours: Will need to attend a minimum of four two hour online mentoring sessions. Sessions will be held at different times so make certain everyone can find a time to attend. Requires the submission of four case studies for review, plus participating in the review of an additional eight case studies prepared by other students. Total time should be about 20-25 hours.